With the continual decline in the number of physical letters being posted, it’s perhaps no big surprise that postal services are always on the lookout for new ways to make a buck, and the CEO of Australia Post, Christine Holgate, has suggested one particularly new and innovative way for the flagging company to join the cutting edge... almost literally. Speaking to a Senate committee on May 23, Holgate revealed that she’s been discussing the concept of drone deliveries with some of her international postal counterparts, specifically the Swiss. 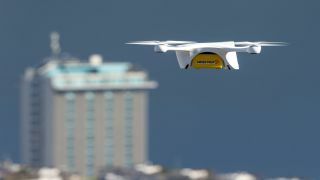 While many countries don’t allow the use of drones for deliveries, Holgate said that “in some countries, including Switzerland, they are using drones [to be able] to carry blood to points of accidents and Swiss Post are doing that”. She explains that to keep up with large international-delivery companies like TNT and Toll, Australia Post will need to embrace automation “to compete more effectively against them”. According to Holgate, the Australian postal service is currently working with Swiss Post “to see what we can learn from what they have done, and to see how we too can offer those services for accident and emergency”. A press release on Swiss Post’s website describes the drones being used in Switzerland for laboratory and emergency deliveries. Not including blades, the quadcopters measure around 80cm and can carry up to 2kg of weight to a maximum distance of 20km (12.4 miles) at an average speed of 36km/h (22.36mph), so they're quite flexible. And, as they can fly in a direct line and don't need to deal with vehicle traffic, could be much quicker than deliveries sent by road. Matternet, the company behind Swiss Post's delivery drones, has also proved they can be quite gentle and stable by successfully delivering a cup of coffee via quadcopter to a waiting van in Zurich last year. Amazon has been testing various drone delivery methods in the US, and the online marketplace also launched Prime Air, its automated quadcopter delivery system, in the UK in 2016. That’s not all. Google’s Project Wing took to the air in Mexico and Australia to deliver food and medication to remote communities after tests were carried out in the US, and 2016 saw Domino’s first unmanned pizza delivery in Auckland, New Zealand. It seems like the days of mail delivery on foot could be quickly drawing to a close, with even Canada Post reacting to the threat from Amazon's Prime Air service in July 2016, saying it will also opt to use unmanned quadcopters for certain deliveries.